If I could hazard a guess, I would say most people live paycheck to paycheck. Things are pricey and it's often tough to make ends meet. Apparently this affliction also extends to the upper classes. Consider an article a friend sent on the budget breakdown of a couple who earns half a million dollars a year and still lives paycheck to paycheck (hint: we're supposed to feel sorry for them). 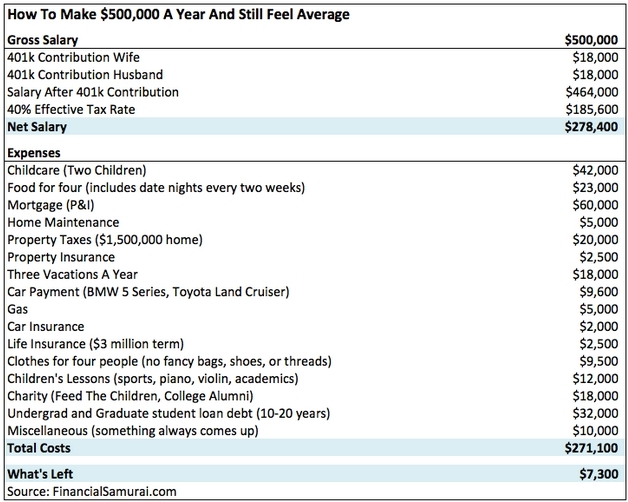 "Sam Dogen of 'Financial Samurai' breaks down the budget of two New York City-based spouses, each of whom makes $250,000 a year as a lawyer," starts the article. "They're 35 years old and they have two young children. 'This one couple shared their story and I decided to anonymously highlight their reported expenses,' Dogen tells CNBC Make It, with a focus on why they end up feeling 'average' even though they’re such high earners." Having lived with extreme frugality for the last 25+ years, is it heartless of me to feel very little pity for this family? Let's go over their numbers. New York City is clearly an expensive place to live, so it's a good thing they have salaries commensurate with their living expenses. Still, you can't tell me there aren't places they can economize. I will work on the assumption they're not interested in having a stay-at-home parent or moving to a less expensive area. Childcare for two children: $42,000. Presumably they have a nanny. Our daughter is a nanny. This isn't an outrageous cost for NYC. Food for four: $23,000. This is nearly $2000/month! What do they buy for $500/week? Learn to cook. Oh wait, maybe they don't have time. Mortgage: $60,000. That's $5,000/month. Yowza, must be a nice home. Still, this is NYC, so I guess that's not outrageous. Home maintenance: $5,000. No argument, this is probably reasonable for where they are. Three vacations a year: $18,000. Again, yowza. But from what our daughter reports as a nanny, this isn't an uncommon expense. Car payments: $9,600. This is $800/month. I guess if you like nice cars, this isn't unreasonable, though I've always heard driving in NYC is redundant thanks to their public transit system. Clothes for four people: $9,600. This is $800/month. I'm certainly glad Don and I don't have appearances to keep up, because even when there were four of us at home, we probably spent $200/year (not per month, per year) on clothes. Now, without growing children and with just the two of us, it's more like $50/year. Children's lessons: $12,000. That's $1,000/month. I sincerely hope the kids are talented in their music and sports choices, because that's a lot of money. Charity: $18,000. That's a generous amount. Good for them. Student loan debt: $32,000. That's over $2600/month, which staggers me and is a superb example of why I recommend avoiding student loan debt like the plague. Miscellaneous expenses: $10,000. This is a bit over $830/month, probably not unreasonable for NYC. "After taxes, fixed costs, childcare and discretionary expenses," notes the article, "there's only $7,300 left each year to go towards other savings goals, investment accounts or retirement funds. ... 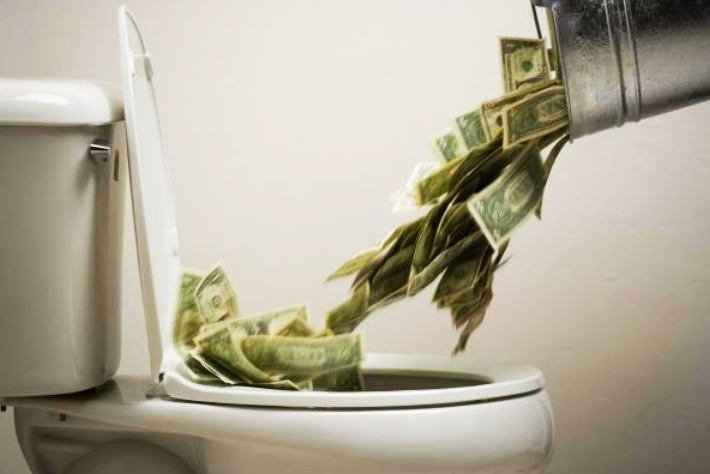 Ultimately, a hefty paycheck doesn’t always guarantee wealth or financial peace of mind. By contrast, budgeting and living beneath your means, no matter your income level, can help you out tremendously in the long run." Like all budgets, this family has both fixed expenses (childcare, mortgage, car payment, utilities, etc.) and floating expenses (food, entertainment, clothing). But another factor these people should consider in their budget is their ego. 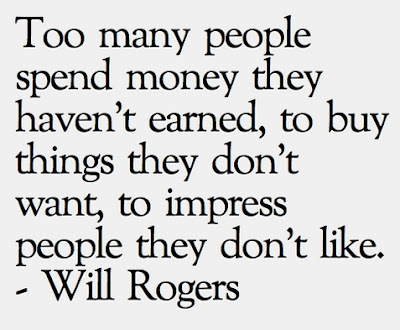 How much money do they spend trying to impress others? This is another difference between NYC and other less-crowded places: impressions matter. That's why they spend so much on housing, vehicles, clothes, and lessons for their kids. Now I realize I can't redesign everyone's lives according to my personal convictions, but let's take this family and do just that. Let's take them out of NYC and put them in, I dunno, Omaha or Great Falls or Spokane. Wham, their housing costs and and taxes are probably cut in half. So, presumably, are their salaries (bringing them in the range of $250,000/year). Now let's keep one of the parents at home to raise their kids. Sure, that halves their salary again (to a presumed $125,000/year), but it also eliminates childcare expenses as well as some of the discretionary spending such as food and clothes. Quit with the fancy vacations already (try camping). Pay off your cars and buy used next time. There's nothing that can be done about student loan debt, sorry. So can the average family live comfortably on this mythical $125,000/year? Let us hope so. Considering what we earned during our parenting years, raising two wonderful and well-balanced children and living a perfectly comfortable lifestyle, I sincerely hope so. I live in NY on Long Island. They could easily commute and cut there costs in half. It would be more travel time. They are choosing these things so they get to live with it. I don't feel sorry for them. I feel sorry for their kids because they are going to do the same thing when they grow up. When my kids were little, I didn't work outside of the home. Working moms would tell me how lucky I was that I didn't have to work. Luck had nothing to do with it. Hard work and sacrifice is what it was. My husband and I wanted us to raise our kids. He worked long hours to make sure I could stay home. I cooked, cleaned, did yard work, grew a garden, canned food. We were very happy to go away camping once a summer. We drove used older cars. If our clothes budget for the 5 of us for a year was $1000 I would be shocked. Now that my youngest is getting ready for college we are still lucky according to people. We are not taking out student loans for her. We have been working hard saving money so that she doesn't have Stupid debt. I'm sorry that other people need a new car every 2 years and have $1000 pocketbooks. My pocketbook is from an estate sale($2) and I drive a 2006 Sienna. The only vacations we are taking this year is to go visit my oldest daughter out of state and stay at her place. We are willing to do this for our kids. It is all a choice. By the way, we don't live paycheck to paycheck and we don't feel deprived. Well, we have 4 kids all still at home (though our oldest turns 18 this year, and I'm already stocking up on wine and Kleenex even though she has no plans of leaving home yet). Hubby earns a (very generous, IMO) net salary of a little more than $60K a year. I haven't held a paying job since 2001, although I did use money my mother left me to pay off our house and student debt. We contribute 10% to savings, 10% to retirement, and 5% to an HSA every paycheck. He drives a newer Subaru and wears new clothes from places like Penney's, because he feels better about himself that way. I drive a 12-year-old rebuilt minivan with crappy paint and wear secondhand clothes, because doing anything else makes me feel silly. We have everything we need and most things we want. Including lessons for any kids that show a consistent interest in something (so far, two kids have played rec league soccer, one took French lessons, which I could have taught myself, but she wanted to take them with her friends, and one is taking flute lessons) and a bloody expensive luxury vacation for at least some of us (H and me or H and the older kids) almost every year (sticks in my throat, but it's something he dreamed of, and "muzzle not the mouth of the ox" as the saying goes). Our oldest has a part-time job. She got it because she wanted her own 2laptop, and kept it because she doesn't like to quit at anything (and her grades are still OK). I wish she'd come back to work for me instead, but I'm aware that she can't write "I've been my mom's right-hand girl since 2009" on a resume. We're not in NYC, by any stretch of the imagination. But we are closer to Pittsburgh than I want to think about (I guess what they call the exurbs). I get SO tired of people telling me I am "lucky" to be able to stay home to raise my kids. Luck had nothing to do with it! Like my mother before me, I am a college educated, SAHM, who always knew that IF I had kids I was going to be the one to raise them. I also knew that I wasn't going to have kids outside of marriage, so anyone I married had to be on board with this plan if we chose to have kids. I made a series of choices based on my vision for my life. I am a firm believer in choice in all things, which means I also believe that individuals should bear the responsibility for their choices. I don't care how much money you make, if you live beyond your means, you are always going to be poor and it's your own dumb fault. I was thinking about my car the other day. It is a pontiac vibe from 2008 just before Pontiac died. It was purchased new but I got a great deal on it because the economy was starting to die. It has 83K miles and a few things have stopped working but it still gets us from point a to b just fine. I could purchase a new car but at 74 why bother. Besides if I got a new fast car I would probably just wreck it as I no longer have any reflexes. I have no money worries because I worked for a great co (Texas Instruments) for about 25 years and my wife was a teacher. We lived below our means most of our life and thus now have money for our golden years. There are times that I wish I had done more back when I still could physically but it is what it is. I salute your family for what you have done with your life and how you have raised your girls. Don makes wonderful tankards, I have 2, and I just love them every time I look at them. I am very glad that I found RR 10 years ago and have just loved the ride. I've lost count of how many "vacations" spent at home doing various projects and maintenance. Yes, I know this couple. They have been replicated about 30,000 times.They fight about money and have little time for their own children or pets: but the kitchen has marble countertops and handscraped 6 inch plank hardwood floors. They have 2 Mercedes in the garage, 4 bathrooms, and a pool, spa, and $250,000 motorhome. They spend a small fortune at the organic grocery, and then when the food comes home, it goes into a state of the art stainless steel french door refrigerator. In 20 days, the maid will clean the fridge and throw everything out as it has mold, expired, or no wants to eat it. Yet, this couple MUST WORK, because "everything is so expensive". Until bankruptcy or TEOTWAWKI hits, this couple will never change their ways. What a sad life!! Back in 1964 I joined the Air Force. I was a little shocked to discover that my monthly pay was $86. I realized that for a couple of years I wouldn't even be able to afford to own a cheap $50 car. I spent the next six months taking (getting paid to) other GI's KP duty. I got between $6 and $10 a day, more on a holiday less on other days. KP was essentially 12 hours of work. After 6 months I had saved $400 hard earned dollars, enough to buy and insure a car. Life is hard, but that is what trains us to survive and deal with life's problems. Somethings missing - where's the government mandated health insurance and Medical costs? High stress life, young kids and they never go to the doctor? I temporarily quit outside work when our daughter was born. I budgeted like crazy to make ends meet and to have money for hobbies (my husband's antique car and my crafts) and church contributions. I made clothes for my daughter and me, cooked from scratch, and grew what vegetables I could on a relatively small lot. We lived in a fairly nice house in a nice neighborhood. Our vacations were to visit family and a once a year weekend to a car club convention. The two of us got a good laugh when one of my husband's co-workers asked him where our outside income came from--apparently it had been a subject of discussion as to how we lived so well unless there was other money from somewhere. I didn't resume outside work until our daughter was in middle school when we started serious saving for her college--she graduated from a private college with no debt (she contributed with scholarships and part-time work) and bought a house three years after graduation. The apple doesn't fall too far from the tree. In 1984 we escaped from NYC. It took a career change to do so, but we wanted to get our kids out of the NYC schools. Income wise we have always been middle class, but we always had food on the table, and our bills paid. That included when I was out of work for 10 months, followed by a temporary job on the other side of the country from my family for the next 10 months. God has been good to us, and we now enjoy our kids and grandkids. Hi Patrice - Many people believe there is nothing that can be done about student loan debt, but there definitely is. It requires some thought and planning prior to choosing the profession one wishes to engage in however. If a person was to get a Masters degree in Nursing, for example,and become a nurse practitioner they could apply to join the Health Service Corps. If they agree to work for 2 years in an underserved area, they can get up to 50,000.00 worth of student loan debt paid off (tax-free). All while earning a salary between 75000 - 90000, depending on specialty. The problem is, just like in the health insurance scam market, many people just assume that the commonly held view is the only thing out there. The Indian Health Service offers similar loan repayment deals, as does the VA. These options are available to many - doctors, nurses, dental hygienists, social workers, counselors, etc. I know, I know, who wants to work for the government cheese, but this is one way of spending my tax dollars I can at least hold my nose and say I don't actively disapprove of. Most of my sparsely populated mostly rural state is considered an underserved area. I told my co-worker about this because she was worrying about how she was going to pay off her 80000.00 student loan debt after she became a nurse-practitioner. She is now in the process of making that happen and enjoying life as a young mother with one less worry on her plate while helping out some people who need it. A win-win in my book. Good grief! I'm mean, we are surviving on $36,500 a year with a family of four, we must be destitute! Can you imagine this family on OUR budget?